When I found a puppy on the corner, I did not know what sort of dog he was. He was cute but very sick, so I left him with my vet that Friday afternoon (Dec. 1, 2006) in an effort to beat the parvovirus he had. We got him back on Monday afternoon and started on a program of feeding him up, as he was a bit boney. Over the next several days he perked up and started to play with our other three dogs. We began to wonder what sort of dog he was. Initially we thought he may have been a Weimaraner because of his silvery grey color, but as the weeks and months went by it became obvious that wasn’t the answer. He just didn’t fit that picture. 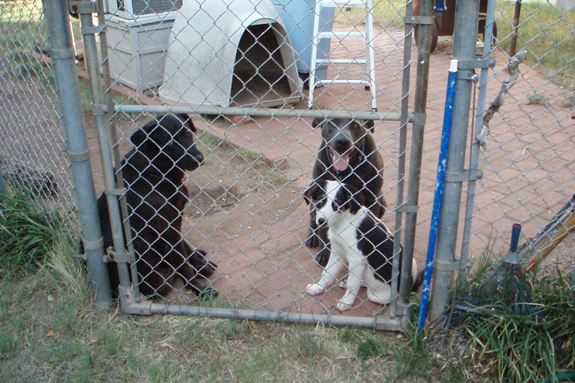 So we began to ask around – trainers, vets, anybody that knew more about breeds than we did. As he grew and filled out the consensus came around to pit bull! That set us back a bit. I mean, we’d never had any personal experience with the breed, and the standard media story you hear is negative. So I started to hunt around on the net trying to find some way to get this dog in a situation where he would have a future – pit rescues, places that trained them for rescue and police work, that sort of thing. I mean, we weren’t really afraid of him; he was a sweet little guy, intense in a “bull in a china shop” sort of way. 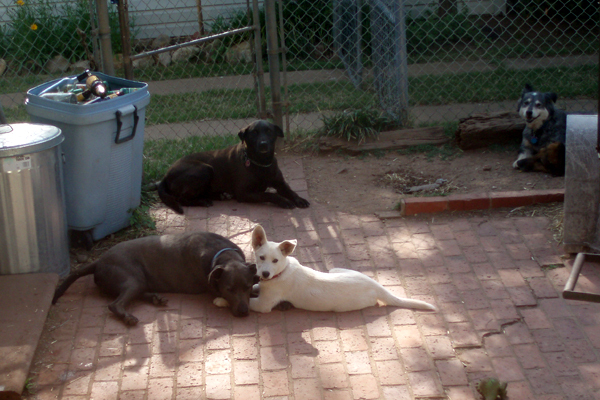 He loved playing with our other three dogs and tried to play with our cat Sparky. Although Sparky is dog tolerant, he doesn’t like to get slobbered on. All the places I talked to about Parvo said they pulled dogs that were in danger of being put down and as Parvo didn’t seem to be in that position and wasn’t going to be, that no they couldn’t help me. Besides they were filled up for the most part. I could not fault these people for not being able to help beyond giving advice, encouragement and info on places to look for more information on the breed. Then I began a dedicated search on pit bulls, their nature and history in order to steer myself to a future of having a pit bull in the pack. I mean, if I was going to be responsible for this allegedly “bad dog” I needed to know how to handle him. I had heard of Sergeant Stubby and discovered Petey, the dog from “The Little Rascals.” I had watched the show as a kid but did not know what type of dog Petey was. I came across Wallace the Pit Bull of Frisbee fame and discovered, from pictures, that my own great grandparents had owned a pit bull or two way back when. Nanny dogs, now that really struck me. I mean yes, Great Pyrenees, Newfoundlands, Labs and other dogs sure, but pit bulls? So after more reading and studying, I had a conversation with the trainer at out our local PetSmart store. 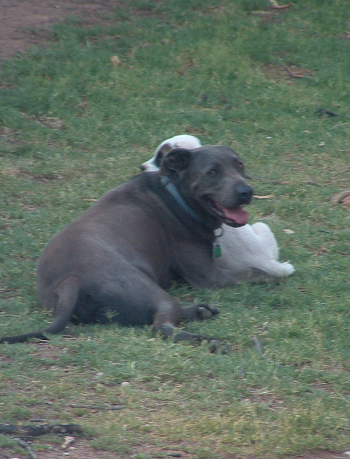 He was a great believer in pit bulls, having had several over the years. I began to see Parvo in a very different light. Not to mention Parvo’s own developing personality. He had never met somebody he didn’t like and was happy as a pig in a puddle. He always had a smile on his face, big grin and all, tail wagging his whole body. This dog was a happy camper. He loves to play fetch and is always ready for a petting session and belly rubs. We have been to the dog park where he has met other dogs and got on well with them – he even had one Border Collie steal the ball right out of his mouth without complaint! He just looked at me as if to say “Hey! He stole my ball!” Good dog Parvo! So yes, I shed my fears and embraced this dog for the treasure that he is. My vet tells me that Parvo is a very good patient. He is calm and gentle on the exam table, never offering any bad behavior on our visits. And about four years after I found him I started fostering puppies for our local humane society. Parvo and the other dogs would take turns being big brothers (and sisters) to the puppies, teaching them doggy manners and playing with them. I can’t tell you how proud I am of all of them for this help. I am a convert to this breed of dogs. Treat them up right, give them a loving home, and you’ll have one of the best, most loyal dogs you could possibly want. That’s our story and I’m sticking to it. Neat story. It’s great that your pack accepted Parvo. Thanks for giving Parvo a home! Wow for a couple of reasons. One, you took a sick puppy, who was going to cost you beaucoup money, and chose to see it through. Then you found out your baby was a dreaded pit bull and you had an open enough mind to realize he was a dog first, and magnificent in his own right second. Not many people would do either. Brava! And loved the video, too. Thanks for taking the little guy in! And thanks for doing the research to learn the truth. I have 3 dogs, 2 Pitbulls and one Blue Heeler. They have been together since they were puppies, and are now 5 years old. My life wouldnt be as fun without them. GreggBarnes Thanks for sharing Gregg! We’re sure your house is loads of fun.